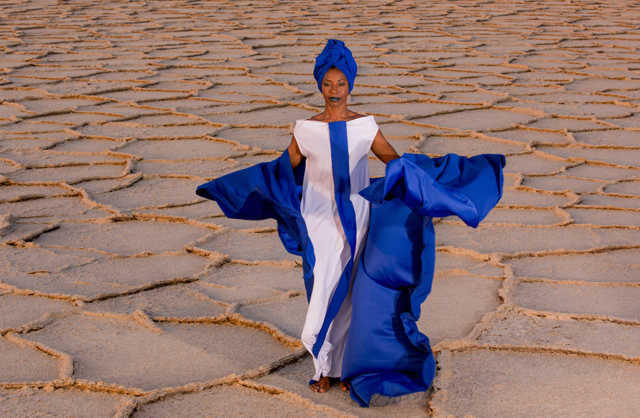 New York (TADIAS) — Ethiopian artist and photographer Aida Muluneh — whose work was recently part of the “Being: New Photography 2018″ exhibition at the Museum of Modern Art (MoMA) in New York — recently collaborated with acclaimed Malian singer Fatoumata Diawara on her new album entitled Fenfo (“Something to Say”) and directed the video for her single entitled Nterini (“My Love”). Fatoumata’s first album was ranked #1 for 6 months on the world music charts in 2011. Aida Muluneh is the founder of the annual Addis Foto Fest and her photography work is in the permanent collection of several museums in the U.S. including the Smithsonian National Museum of African Art. Aida’s body painting photography was also featured earlier this year in March in W Magazine. “In a world of 7 billion people there are 1 billion migrants. This is the story of one man’s journey,” says a statement in the opening of Fatoumata’s music video. The lyrics describe the heartache of two lovers who are separated from each other. The music video for Nterini was filmed in the Dallol, Afar region in Ethiopia. “The location is a photographer’s dream. I hope you enjoy watching this as much as I enjoyed directing it,” shared Aida on Instagram.